A tight budget and single parenting go pretty much hand in hand. At least in my experience they do. But, that’s probably true of any household that lives on a single wage. It’s easy to start feeling down about yourself, the world and life in general when you’re watching every single penny, where it goes and how hard it works. That doesn’t mean you have to stay that way. Here are some of the tricks I’ve used to stay positive and optimistic when living on a tight budget seemed like it would never end. Sometimes the reasons you’re living on a budget are beyond your control but sometimes it’s your choice. Being clear about why your budget’s tight is the first step to not just accepting it but making the most of it, too. When my daughter was young, I kept our budget very tight, not just so I could cover our bills and put money into savings but also so we could cover any unforeseen emergencies. Whenever I struggled with my commitment to the tight budget, and usually, it was when I was tempted to grab take-out on the way home from work, I thought about how much more enjoyable sharing a trip to the movies would be than sharing a fast food meal. If your budget is super tight because you’re saving for a car or a house deposit or even a holiday, keep a visual reminder of your ‘why’ on your fridge or in your wallet. Being frugal and living on a tight budget doesn’t have to mean you sit at home all the time and never go out and enjoy life. However, it does mean you’ll need to be a little more creative when it comes to finding fun things to do. Check out what’s happening in your community. You can usually find this information at either the local library or community centre. There are often different free activities that will appeal to all sorts of age groups so, take a look and join in. Another great way to enjoy life is to get outside. Being in nature is not only free, it’s a great way to relieve stress and anxiety. You don’t need to go hiking in the wilderness for these benefits, just take a picnic to the local park. Don’t forget my favourite frugal entertainment venue; the library! Libraries are full of all sorts of entertainment ideas and most of them are free. You can check out everything from movies to audio books plus lots of libraries run regular kids activities like story time. So, if you’re feeling like the fun has been budgeted out of your life, think again. You’ve probably heard the saying that starts, “All work and no play…”. We’ll that goes for budgeting, too. Denial and deprivation never end well. Those of us who’ve struggled with a strict diet know the truth of that statement! Even on a tight budget, you need to set aside an amount for splurges. It doesn’t have to be a lot, just a few dollars every week or two that is just for splurging. For me, that splurge always was and still is a trip to the cinema. When my daughter was young we also had ‘pay day pizza’ which went a long way to keeping her happy. Your treat could be anything you like, a regular dinner out or a date night with your partner or even a special movie night at home with the kids. Family movie nights are a great way to splurge. Everyone can choose a special snack for themselves while you all enjoy the movie you got for free from the library. Oh, and… Pop your own popcorn. Your little splurges are just that, little. The trick is to make them regular, meaningful and low cost. Save a little each week to put toward a meaningful splurge. If your tight budget it for reasons beyond your control, you might want to look at ways of increasing your income either through your current employment or via a side hustle. There are lots of little things you can do that don’t take a huge investment of time or money so when you’re focusing on why your budget it tight, also focus on ways of increasing your income. It can be done. Need more ideas of how to live well on a tight budget? 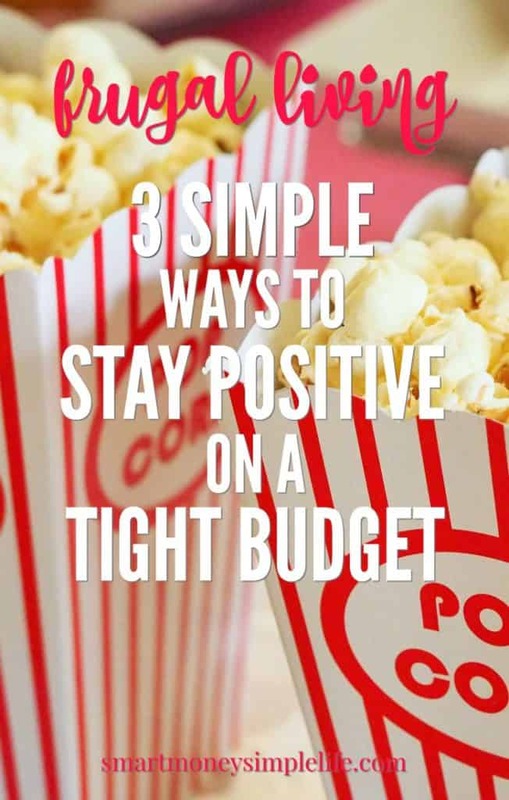 What are your favourite ways to stay positive on a tight budget? These are great ideas! I know that living on a budget can be very emotionally draining, so coming up with coping mechanisms to get through it is the only way to not give up! Great post! Yes, it’s very easy to slip into the ‘woe is me’ mindset… you just need to change your focus a bit. Most excellent advice. I very much enjoyed reading this. As someone a father of 3 on a tight budget I relate to every word you have written. I am so glad you mentioned the library as well, I talk about the library all the time when people ask us what we do for fun. I find the library has tons of hidden entertainment value, not only in its books but also videos to borrow, audio books, magazines, newspapers, etc. not to mention events. Our local library holds events so often I find it difficult to schedule them all in. Well anyway thank you for sharing and hope you keep posting wonderful things like this in the future. I talk about the library a *lot*. 🙂 Absolute treasure troves of entertainment and adventure!